Observes 8th Cavalry Regiment on roads below, preparatory to striking. 8th Cav lost about half its equipment in the bitter fighting as CCF 39th Army placed roadblocks in front of and behind the road-bound US 1st Cavalry Division forces. Initially over 1,000 men of the Regiment were missing, but after stragglers had returned to our lines losses were determined to total only about 600 men. 8th Cavalry's equipment losses included 12 105-mm howitzers, 9 tanks, 1 tank recovery vehicle as well as extensive mortar and small arm weapons. The regiment was inoperable, until casualties and equipment could be replaced. The CCF claimed over half the regiment was annihilated, which gives some idea of the problem of accurately determining battle results. As regards equipment, they were in the ballpark, as regards troop losses they were way off. Just given as a figure without detailed explanation, both the Chinese and UN reports are reaasonable ... but misleading. 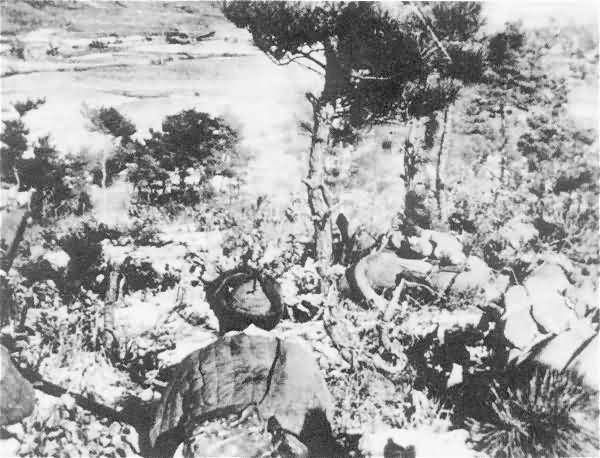 The ROK 7th Regiment at Kojang, and ROK 15th Regiment (at Unsan with 8th Cav) were almost totally destroyed, losing all their equipment and weapons. The CCF 1st Phase campaign was a staggering success for them ... and defeat for our forces. For some reason, probably because of the faulty CIA Intelligence given them as to China's intentions, this did not alarm UN High Command sufficiently to modify their plans and withdraw and re-form Eighth Army into continuous defensible positions with in-depth capability, reliable communication links between all units, and the coordinated artillery support proper when facing large, dangerous and unknown enemies. For about three weeks, such withdrawal and digging in would have been possible. After that, it was too late. The entire Army was to pay the price for this lack of Military Intelligence, and Leadership.